Sacred Springs Farm is committed to the promotion of the Lusitano Horse in all equestrian disciplines including dressage, jumping, 3 day eventing, hunting, and carriage driving. We are working with other European associations and particularly with ABEL, the Belgian Lusitano Horse Association. Inspired by the ABEL’s “Journees Lusitaniennes” (Lusitanian Days), we are planning to hold a two day event at our Farm in Spring 2006. This event is intended to be a “celebration” of the Lusitano Horse, not a typical Horse Show where only a small initiated public understands what’s going on. 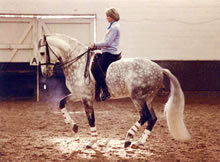 We would like our event to be an entertaining demonstration of the versatility of the Breed. A draft program will be posted here in a short while. If you are a rider, trainer, breeder or owner and you would like to participate, please contact us by e-mail.